This website has been restored using archived content and does not claim any rights to this content. This is not the official website of Watts House Project. The Platform serves as the hub for the organization and has been integral to the facilitation of community-based initiatives, such as the 107th Street Neighborhood Association. 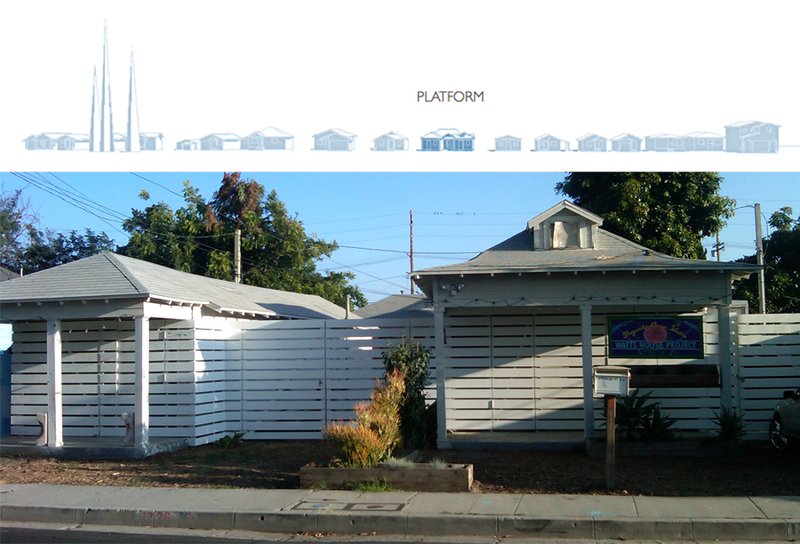 Composed of a central green space and three freestanding shotgun houses, The Platform is a multi-use space, which, in addition to hosting community-run events, will also host an office, exhibition space, and artist-in-residency program. Currently, WHP partnered with the School of Architecture at USC who just completed a major façade improvement on two of the houses and will break ground in Spring 2012 on a full renovation of the facility. ArtPlace awards $370,000 to Watts House Project! ArtPlace is an initiative of 11 of America’s top foundations working in conjunction with the National Endowment for the Arts and seven federal agencies. Its aim is to drive revitalization across the country by putting the arts at the center of economic development and community revitalization. The approach being taken by ArtPlace, known as “creative placemaking,” has emerged over the past twenty years as a promising way to increase the vitality of communities and help them grow. WHP is thrilled about the partnership with ArtPlace, and excited about their funding of WHP’s headquarters. Situated in the heart of Watts, our new headquarters will spearhead construction projects and programs that will be a hub and catalyst for a vibrant Watts community. was born in New York City and is an artist and art educator. Tina visited the Platform back in the fall of 2009 and wanted to make a hand painted sign that would speak to the artistic legacy of the Watts Towers neighborhood and WHP’s vision. She searched the grounds and found an old piece of slightly warped plywood, weathered by many seasons of the elements. She packed it in the back of her car and half a year later returned with a painting that marked the Platform as a site for neighborhood change. “I chose the dahlia as the main image when I discovered that not only is it the national flower of Mexico, but that when Christopher Columbus brought the dahlia to Europe it became wildly popular in the Italian ornamental gardens of the renaissance. I thought it was a great link between Simon Rodia and the neighborhood he immigrated to. Also, the dahlia symbolizes dignity and splendor, which I thought was perfect.” Tina Villadolid, 2010.